I am sharing with you today some ways to help kids learn how to sound out nonsense words and even some REAL CVC words that actually make SENSE! (Imagine that!) I also have some guided drawing projects we have been working on over the past month, along with some other things for the February holidays and stuff I have been using for test review. On a personal note, this week, my class braved a field trip to the Aquarium of the Pacific in Long Beach, CA in the rain, no less! If we are REALLY lucky, then we will get to do our great Jump Rope for Heart fundraiser today in the rain as well!!!! Oh, boy! Hey, if they have snow days back east, why can’t we have rain days in California? It just doesn’t seem FAIR! I have never had a day off for snow in my whole life! Boooo! Getting kids to sound out words is a tricky thing! There are a couple of “prerequisite skills” that each child must have in order to accomplish this. * One thing they need is fluency in naming the letter sounds. In other words, they need to have really internalized the sounds of all of the letters, so that they can say them quickly and easily without really even thinking about it when they say them. I think that Zoo-Phonics really helps with this skill a lot, so check it out if you are unfamiliar! I wouldn’t consider teaching Kindergarten without it! And I’ll tell you something else: if my school district told me that I couldn’t use it anymore, I would just pull out the cards and supplement the given curriculum when no one was looking, because it really is the fastest, most efficient way that I know of to get kids to learn those all important letter sounds. I made my Singable Songs for Letters and Sounds CD and DVD to help with this as well, and it really has proven to be the missing link for children that cannot remember the letter sounds AND their names with any other method. It has worked for both regular and special education students alike. For more info on combining Zoo-Phonics with HeidiSongs, see my blog entry on April 18, 2009. * Students also have to be able to hold at least three sounds in short term memory long enough to blend them into a word. This can be quite an overload for a child that is still unsure of the sounds, since that child must dedicate a good part of their available working memory to simply identifying each one. Therefore, a child that seems to have short term memory issues can be helped a little by having them “over learn” the letter sounds so that these (at least) are not something that is adding to the child’s memory overload. Other than that, I don’t really know of other ways to help a child learn to “stretch” their auditory memory other than practice: start with two sounds and then work your way up to three! If anyone out there knows of any other ways to help with this, please let me know and I will pass these tips along! I must also say that my CVC book has been a great help to me every single year since I created it! I especially love the flashcards and the pictures, and the fact that you can use the larger cards on a pocket chart, and send a smaller version home with children to practice with at home. I use the worksheets every week in their homework and also sometimes at school. There are worksheets that go with them that are for sale on my website either in book form or as a download, along with those wonderful bingo games that the kids just LOVE! I know that I made it- and therefore I shouldn’t say it- but I cannot recommend this resource ENOUGH! I don’t know what I would do without it. And I am hoping to write a second volume with other word families in it someday, too! I’ll have to put that on my VERY long “to do” list! 2. Gone Fishin’ for NONSENSE WORDS! Do You Have to Teach NONSENSE WORDS? Do you wonder WHY?????? Kids really do need to be able to blend random sounds together to form a word- even if it is a nonsense word! This is very important, since it forces the children to rely on their phonics skills to read accurately rather than just make informed guesses based on the context of the passage they are reading. Also, when they are older, they will need to be able to sound out each syllable or “chunk” of those longer multi-syllabic words that they will surely encounter as texts become more advanced. Without solid phonics skills, children may later find themselves unable to progress to reading texts with longer words, since these must be decoded (sounded out) instead of memorized. 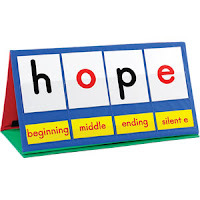 To practice this sounding out both real and nonsense words, I like to use this small pocket chart that I got from ReallyGoodStuff.com. I love this chart because you can simply keep pulling different letters in and out of the chart, either at the beginning, middle, or end of the word, since you can easily fit a bunch of cards in the pockets at once. The chart sits nicely in my lap as I sit in front of the class, or on a table to work with a small group. It’s called the Really Good Stuff® Word Blending Desktop Pocket Chart And Stand and it costs $19.99. I have used mine now for so many years, it’s just about worn out! When it falls apart, I will definitely buy another! I recently made one that you can print yourself, and posted it free on our website. It’s included in the packet of visual aids that go with the Sound Blending Songs for Word Families CD, and you can get it right here. Last weekend I decided to try to make a worksheet where the kids would color the pictures by real word or by nonsense word, and I decided to go with a patriotic theme since we are now learning about the presidents during February. We tried it on Thursday, and I was pleasantly surprised that most of them found it pretty easy! First I modeled the entire thing whole group and explained it thoroughly. This works especially well if you use the document camera to show the children the words and read them along with you. Then I sat with them while they did it during their small group rotation and stopped the children from coloring one by one and listened to them read the words to me individually, asking them if each word was a real or nonsense word. This turned out to be a wonderful way of keeping everyone happy and busy while I listened to each of them read one at a time! I am including the master for you here today! I hope you enjoy using it with your students. Easter Egg Nonsense Word Worksheet. You’ll find more info about it on my “Egg Blog” here! Ladybug Nonsense Word Worksheet. You’ll find more info about it on my “We’re Bugging Out All Over” post here. You will also find more nonsense word worksheets here to purchase if you are interested. You will find a song about nonsense words on our HeidiSongs Sound Blending CD/DVD. Below you will see the words to the song, as well as a clip of what the DVD looks like in general. I wrote the nonsense word song to help kids remember that nonsense mean nothing! The children would read a word with me that could be either real or nonsense. Then we would together decide if it was a real word or not. If it was real, then we all gave a thumbs up. If not, we all made that silly “blowing raspberries” sound! The kids loved it because they got to make a noise that was generally not allowed, and it kept the interest high (or at least a little higher!) in the lesson. It also helps to have someone use the real word in a sentence, and perhaps have someone act it out if there is time. Then have someone try to put a nonsense word into a sentence, and let everyone see how it simply doesn’t make any sense at all. This song is from HeidiSongs Sound Blending Songs for Word Families, which was written to help kids learn to sound out words. Lincoln’s Log Cabin Freebie from HeidiSongs! Idea: Glue a penny with Lincoln’s head showing on the window! This is one simple little art project idea that I got from a teacher that I used to work with who recently retired. I have no idea where she got the idea from! In this project, the children glue down popsicle sticks in a rectangle that is xeroxed onto the paper ahead of time. Then they add a triangle roof and a door, and then decorate their paper so that it looks like the wilderness surrounding that famous log cabin. I am including the master that I made and instructions as a free download for you today! I hope that it will be useful to you. Below you will also see what my President’s Day Pinterest Board Looks like! Follow me on Pinterest for more great ideas like these! 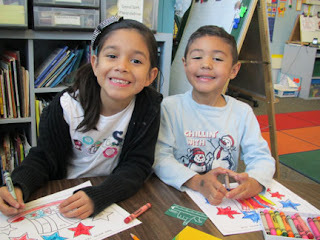 Follow HeidiSongs’s board President’s Day Crafts and Activities for Pre-K, Kindergarten, and First Grade! on Pinterest. This week, we finished our Look Out! 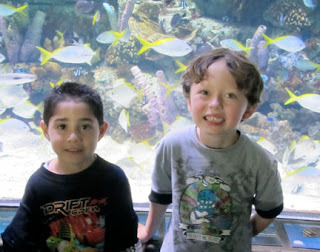 Book on sea animals from the Little Songs for Language Arts Singable Books Printable Projects Resource CD, that culminated our unit with a trip to the Aquarium of the Pacific in Long Beach, CA! I have been teaching the children to draw sea animals over the past month, and have been snapping some pictures of their drawings along the way. It’s such a fun activity, and I love that I see their drawings pop up in their writing assignments and when they decide to draw during playtime, etc.! I wrote up the directions for a few of the animals for you and including them here for you today. Please note that we sure did NOT draw ALL of these animals on the same day! I think we drew together at least twice. Sometimes when I want to draw with the children and we don’t have a lot of time, I just pass out the white boards instead of the paper. 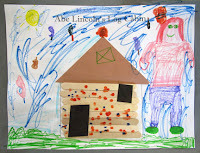 This allows the children to make lots of mistakes and keep trying as much as they like. I think they find it less frustrating when an animal kind of needs “multiple attempts.” Even though I always tell them that we are just practicing and that mistakes don’t matter, a lot of those kids just don’t want imperfections on their papers and can really stress out over it. Every year, there seems to be one child that will find their mistakes so frustrating that they wind up in tears nearly every time we draw! If I can, I put that child with a parent volunteer if one is available, or right next to me on the floor. If the child is getting frustrated, I just grab a pencil and lightly sketch in the part that is stressing the child out, which is usually just a diagonal line or two! Then the child can happily proceed by tracing over my line with his or her black marker. Enjoy! I hope you enjoyed this blog post! If you did, sign up for our email updates! You can also follow this blog on Bloglovin’, and keep in touch with me on Pinterest, Facebook, Twitter, TPT, Google+ and YouTube, too!